Albert Pujols, without a doubt, is one of the most beloved players that ever put on a St. Louis Cardinals uniform. During his time with the Cardinals, his stats and playing skills showed that he was an impressive player who was destined for greatness. The numbers he racked up playing for the Red Birds then backed up those optimistic accusations. Pujols currently holds a very impressive overall batting average of .326. He also has racked up 446 home runs, and seems destined to break the 500 mark. There were many who were certain that he would do that in 2012. He also has 463 doubles, 2,096 hits and 1,338 RBI. To just about anyone, those are Hall of Fame numbers. The controversy over Pujols started in the off-season between the 2011 and 2012 season. It was thought that Pujols would stay in St. Louis. The team had become a true powerhouse in the National League Central Division. They had also won a World Series with Pujols on the team. During the off-season the team locked down Matt Holliday with the hope that Pujols would stay to the team to back him up. Even Pujols seemed to indicate that staying in St. Louis was what he wanted to do. At the same time, he felt he was worth more money. For some Cardinals fans, his desire for cash soured his good-will among the fans. In December of 2011 the announcement came that most Cardinals fans feared. After rumors that Pujols might be going to the Florida Marlins, it was revealed that he had accepted a deal from the Los Angeles Angels of Anaheim for a staggering sum of $254 million. The deal with the Angels was for 10 years, while the Cardinals made an offer that was for only five years. Pujols' wife would later tell the media that this was the true reason for Pujols deciding to head to California. Many Cardinals fans were devastated, while others felt that Pujols should get as much money as he could while he could. For fans of the Angels, the expectations for Pujols could not have been higher. 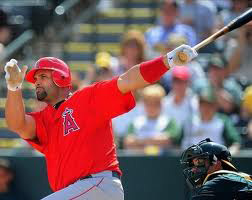 However, as the 2012 season started, Pujols got off to a slow start, to say the least. During the month of April, despite appearing at the plate 92 times, he had not hit a home run. In fact, he did not hit a home run for 28 games in the 2012 season. In fact, Pujols had not hit a homer in 33 games going back to the 2011 season. That remains the longest home run drought of his career. As to what happens next, it remains to be seen. With that kind of spotlight and pressure to perform, it could cause any player to have problems. 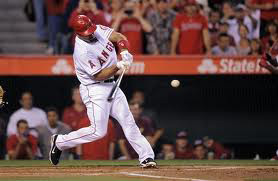 However, many feel that Pujols will eventually hit his stride and that number 500 could still happen in 2012. As for the fans of the Angels, they are still holding out hope that Pujols will not become a $250 million albatross that hands around the team's neck.